Love this shot of my Mando! 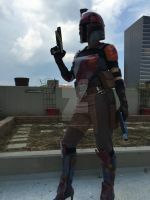 I'm super happy with this build and proud to have gotten accepted into the Mandalorian Mercs special ops brigade. Made by me, helmet and armor are made from sintra, soft parts were custom sewn from various fabrics. Cool! I want to join the mandalorian mercs when I'm old enough. Doesn't mean you can't start you can't start working on your armor now. Well, I would, but my parents don't like the idea of me making an armor and wearing it to conventions. So, I'll have to either get my own money for it or wait untill I'm old enough to do it without their permission. Ah, makes sense. Well don't give up on it. It's alot of fun. Maybe your parents will lighten up to it. Wait wait wait, this is your custom!??!! ... I need to step up my game on my "Mk 2" kit. LOL. Is that 3mm Sintra? The sad thing is I've already upgraded some stuff, it's a sickness. And yes, the plates are 3mm sintra that's been layered.